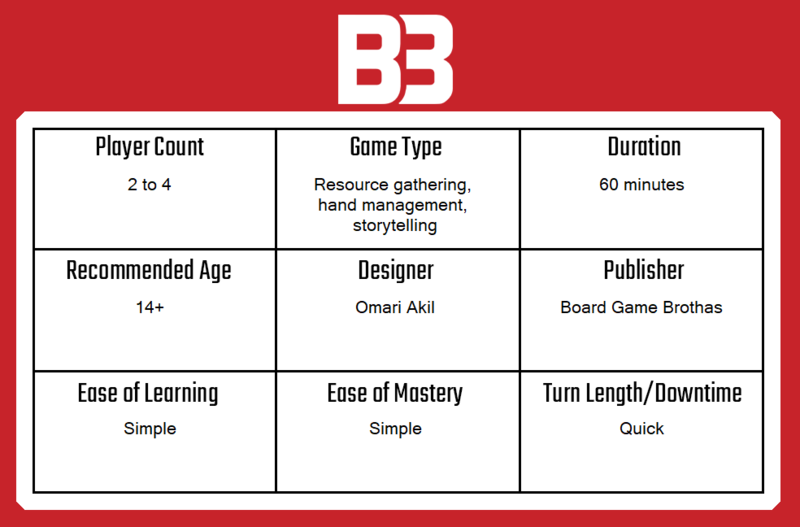 Regular readers of Big Boss Battle’s Tabletop section will be well aware that we’ve been tracking the progress of Rap Godz from recent startup team Board Game Brotha’s for a few months now. I’m delighted to say that the game has finally reached Kickstarter and we’ve got our hands on a preview copy. Featuring distinctive artwork and massively thematic gameplay, Rap Godz is a straightforward game that comes alive thanks to a great timeline mechanic and the way that it fosters light roleplay. The Kickstarter is live now and you can back it here. In Rap Godz, up to four players each take on the role of a named rapper which they can either choose, draft or be dealt randomly. They also receive a home city, which again can be dished out in any way you choose. The most fun combinations are random or drafted though, because a huge part of playing Rap Godz is roleplaying the persona of the character you chose. What led them to becoming a rapper? Was their journey hard, resulting in a masses of street cred? Or are they a trust-fund rapper with access to lots of wealth but very little talent? Each pairing of rapper and city card will result in a character that has a number of traits, including their starting hand size, their cash flow, rap skill and street cred values and other, more specific bonuses that can usually only be used once per album (which in Rap Godz means five rounds of turns, that are in turn referred to as tracks.) There are a few other things on player cards, like bonus plaques (essentially victory points) for achieving a certain value on one of the skill tracks. The player who has the highest plaque value at the end of the game will be the winner, but plaques come from a number of sources. Aside from the specific abilities that each character might have, there are also the “basic” album cards that add plaques (and upgrade skills) and the “come upz” cards, which offer more powerful variants on the album cards. Players might also take offence to each other, which results in the use of “beef” cards, that introduce an element of risk and reward, but can hamper the opponent. Mechanically, Rap Godz is a game of playing cards to increase skills and add plaques. Increased skills provide access to better cards and overall, the cards in each of the decks that correspond to the three albums over which the game takes place become more powerful and focused. Rap Godz tracks the placement of these cards as a sort of timeline, which is a thematically exciting concept because it really enhances the roleplaying aspects that I mentioned earlier. As always with a preview product, it’s difficult to judge the final outcome based on the (admittedly relatively complete) sample that I have here, but I can say that there are a number of already impressive features in Rap Godz that I do think will really help it stand out. Firstly, there’s the theme itself, but more importantly from the component perspective, is how the theme is applied visually throughout. The cards, for example, bring the game together with a consistent theme that is both highly individual and very well aligned to the subject matter. Another feature that is particularly impressive is the board, which is created in the style of a turntable, surrounded by bright, bold graffiti. The players track their cash flow, rap skills and street cred using coloured cubes that move around tracks on the deck. These cubes are then simply doubled up when the score limit on the track (thirty) is reached, so form never overwhelms function. In my prototype copy, I was pleased to see that the cards themselves are both visually humorous and often, outright funny. Among the decks you’ll see cards like “Read a Dictionary” which provides a rather healthy boost to your rapping skills — this card was just one of several that made me laugh out loud, without ever breaking away from the overall theme about up and coming rappers making it big. Mix tapes, viral videos and many more flavorful cards are seeded throughout the decks, making it impossible not to be drawn in to the theme on many levels. The remaining components in my preview deck are all of a high standard as well. I didn’t receive a printed manual, but the digital version I’ve been reviewing is clear and brief, which makes Rap Godz relatively easy to learn and teach. The plaques are chunky tokens in three colours (bronze, silver and gold) each of which depict different values. There are several sets of brightly coloured player pieces, a handful of dice and some red beef cubes, plus a few other tokens and cards that represent randomised goalz (objectives) and such like. Overall, I am excited about what Rap Godz will look like when it launches. The physical components look great and even now, have been specified to a very high standard. The artwork is the standout feature, with a very unique style that you just won’t find elsewhere. As for the board itself, well, when it’s laid out on the table, the Rap Godz board will draw just about anyone’s attention, thanks to it’s unusual record deck feature and the bright artwork that surrounds it. The cards add depth and further theme, so overall, I think Rap Godz is well positioned to maintain lasting appeal. Interestingly, Rap Godz feels quite like some of the card driven Martin Wallace games that I’ve played recently, with a very simple structure that is super simple to get to grips with. What works especially well here though is that the cards which have been played become part of each individual timeline and usually apply permanent changes to the tracks on the board, which I really liked. Turns are very simple and begin by the player either drawing a card from the current album deck, or by discarding a set number of their existing album cards (usually three) in exchange for a more powerful come upz card. The player will then play one card (which can be the one they just drew) that will then be actioned accordingly. Most cards will either provide plaques and increase one of the onboard tracks, whilst others might affect two tracks, but give no plaques. Come upz cards are indeed more powerful and might give even more powerful benefits. At the end of each round of turns, a fader on the board is slid to indicate the next track and after five tracks, the next fader is moved to indicate access that the next album has begun. Essentially then, unless something breaks the rules of the game (and some things do) then the game will take place over the course of fifteen turns per player. Occasionally, one of the cards that can be drawn will be a beef card. These cards are played as normal, but will be targeted at an opposing player, with the possibility for negative effects to be bestowed upon them should they lose the beef. The aggressor in these situations rolls two dice and then picks the higher of the two numbers. The defender rolls one die. The highest number between the two players wins the beef, which is then added to the timeline of the loser — potentially lowering their skill tracks and forcing them to hand over plaques. There are multiple objectives to achieve as the game goes on, some of which will be personal and some of which won’t and it’s also possible to steal other peoples objectives and even to take control of their home cities — based on whatever attribute that city considers to be the most valuable asset that a rapper can claim mastery of. These objectives and side activities all add to the plaque value, but as I mentioned earlier, the winner is the player with the highest total plaque value. Playing Rap Godz is definitely a straightforward, easy to pick up experience, but it’s really the narrative thread that is created throughout which I think differentiates it from other games. Randomly choosing characters and cities is a good way to introduce this idea and it offers the perfect balance between having characterful, prefabricated personalities and an element of creative flair. This approach is continued by the use of a storyline that effectively charts the career of each rapper. It begins in album one with the kind of basic necessities you’ll see in movies like Hustle & Flow or Notorious, where your rapper will struggle to drop a mixtape or get a shout out. By album three, the glitz and glamour will be kicking in, meaning that the thematic progress matches the increasing capabilities indicated by the onboard tracks. Beef cards introduce the ability for players to directly affect each other and to be honest, I was surprised at how much jeopardy is involved with them. Few are massively powerful, but it feels like a fairly risky tactic to use one and you’ll likely only do so to try and peg back a real runaway leader, or simply because it’s fun to do so. Fun, of course, is the most important thing about any board game and Rap Godz is nothing if not fun — it’s light and straightforward enough to play and it has a mechanical structure that really supports its narrative heart. I generally avoid providing clear conclusions for preview games because a lot can change and it can be risky to speculate about what the game will be like when finished. However where Rap Godz is concerned, I feel reasonably comfortable recommending it, simply because the mechanics and theme are so closely linked that it’s obviously a tight, well loved design. I am a big hip hop fan and I really enjoyed developing different personalities and creating stories around them. For players that don’t like the storytelling element (or at least the roleplaying part of it) Rap Godz is still a very fun and highly accessible game, because the storyline is built into your character’s onboard timeline, even if you choose not to act out the role. Players who focus purely on the best numerical outcomes can sometimes accidentally create the most amusing timelines and I love how this all just happens organically without anyone having to try overmuch to achieve it. Finally, the artwork really helps to bring life and depth to the already engaging theme and structure. The approach taken by artist Hamu Dennis is not only unique, but it’s also bold and engaging in a way that few games can boast, whilst the record deck board is very, very cool. If you’re looking for a slightly different kind of board game that dances to the beat of its own tune, then I think Rap Godz is worth backing. If your a rap or hip-hop fan then it’s an absolute no brainer, but even if you just like a storytelling game that has a strong mechanical backend, you’ll have plenty of laughs throughout your time with this one. A preview copy of Rap Godz was provided for the purpose of producing this article. No payment was received for this preview – BigBossBattle does not accept money in return for producing preview content. You can back Rap Godz via its live Kickstarter, which can be found here. Hip-hop-themed strategy storytelling game Rap Godz nears Kickstarter live date!